• Simple and elegant leather jacket, premium quality lasting and durable leather material. • Great color which appears very appealing and sophisticated moreover much suitable to all kinds of attires as well. • Front zip closure which is followed by a standing collar with shorter width. • Four pockets on the whole, two on the chest side being zipped whereas two on the waist sides with the usual layout as provided. • Full sleeves with cuffs and zips. • Very comfortable inner viscose lining to provide ease and convenience. • Durable and washable material which may be worn for seasons and seasons. I love filmstarjackets.com for providing tall jackets, pants, and leather vests for those of us who are long limbed. This Dean Ambrose jacket is beautiful and fits great. I ordered this sophisticated grey leather jacket from WWE Superstar. I am 5'9"and weigh 145 and the jacket fits well alone or over sweaters. Very warm, too! "I really like this item. This is one basic wear trench coat and I wear it every day to work. The metro ride doesn’t even spoil my clothing and it lo"
"I have had some Arno Dorian coat before but none of them was as good as this coat. 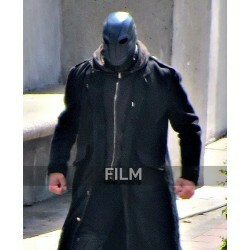 You really do not know how great bane vest is and how stunning you "